There are some dishes that you just think "why would I buy that as a ready meal, when it's not that difficult to make?' On the face of it I would have said that frozen jacket potatoes came into this category. 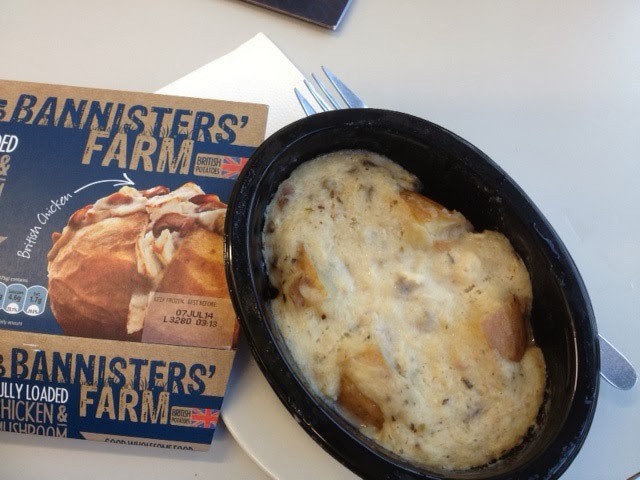 However, I had to eat my words, and jolly tasty they were too, because Bannisters' Farm have a range of frozen British potato dishes that really impressed me. The Fully Loaded Jacket Potatoes are large potatoes filled to the brim with a range of different fillings. 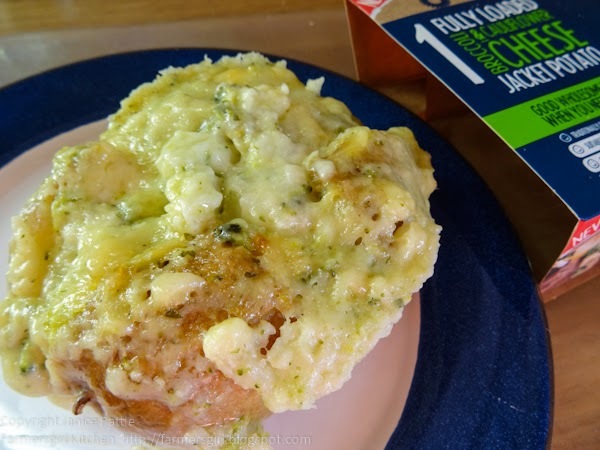 I tried the Fully Loaded Broccoli and Cauliflower Cheese Jacket Potato at home, cooked in the microwave straight from the freezer. I took the Fully Loaded Chicken and Mushroom to work, it was semi-thawed by the time I cooked it at lunch time so took a bit less time to cook. Both tasted very good and very homemade. That isn't really surprising when you look at the list of ingredients, no fillers just real ingredients like broccoli, cauliflower, cream and cheese. In the Chicken and Mushroom: British Potato, British chicken, mushrooms - everything that is listed is an ingredient you recognise and would use yourself. They are also traditionally oven baked and gluten free. The Fully Loaded potatoes are not low in calories with the Chicken and Mushroom weighing in with 460 calories, the Broccoli and Cauliflower Cheese a whopping 482 calories. However, they are designed to be a whole meal and are very filling. Fully Loaded Jackets also come in Cheddar Cheese, Cheese and Beans and Chicken Tikka flavours. Bannisters' Farm also produce some amazing Baked and Filled Potato Skins, the photograph above drew a lot of attention when I posted it on Twitter and Facebook. 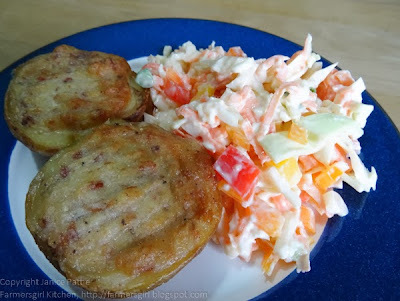 These potato skins are filled with cheese and smokey bacon and made a really tasty lunch with some homemade coleslaw. I think these would make great party food as well as great accompaniments to many main meals. 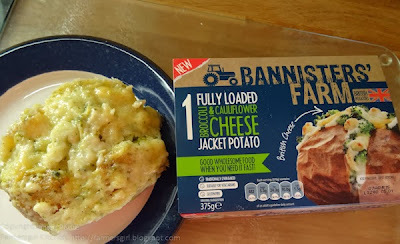 I was provided with a range of Bannisters' Farm British Potato products to review, I was not paid for this post and all opinions are my own.